Christine Blasey Ford, one of the women who have accused Supreme Court nominee Brett Kavanaugh of sexual misconduct, could have committed perjury last week for saying that she has "never" given tips or advice to someone planning on taking a polygraph test, according to an ex-boyfriend. 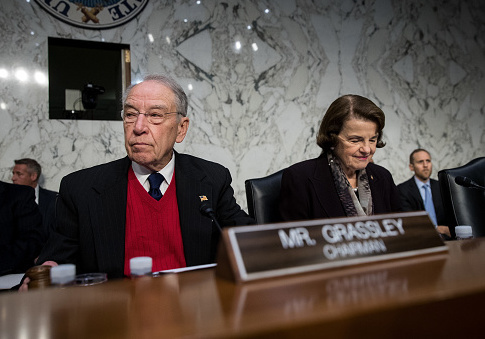 Senate Judiciary Committee chairman Chuck Grassley (R., Iowa) on Tuesday sent a letter to Ford's lawyers renewing his request for "all audio or video recordings produced during the course of Mr. Hanafin's polygraph examination of Dr. Ford as well as all polygraph charts and other data that Mr. Hanafin relied upon in preparing his report." Grassley said they he made these requests before and after last Thursday's hearing, but he has yet to receive them. Ford, a professor of psychology at Palo Alto University in California, has accused Kavanaugh of drunkenly pinning her to a bed, groping her, and trying to stifle her screams at a high school party in the early 1980's. Kavanaugh denied the allegations, as has his former classmate Mark Judge, who Ford claims was also in the room at the time of the alleged incident. Two other people that Ford alleges were at the party in question, have also denied any knowledge of the party or sexual assault. The friend Ford is alleged to have coached on the polygraph test, retired FBI agent Monica McLean, said the charge is completely made up. "I have never had anyone assist me with the preparation of any polygraph. Ever. Not my entry polygraph, not my 5-year reinvestigation polygraphs. Never. I am extremely angry he would make this up," McLean said. "The full details of Dr. Ford's polygraph are particularly important because the Senate Judiciary Committee has received a sworn statement from a longtime boyfriend of Dr. Ford's, stating that he personally witnessed Dr. Ford coaching a friend on polygraph examinations," Grassley wrote. "When asked under oath in the hearing whether she'd ever given any tips or advice to someone who was planning on taking a polygraph, Dr. Ford replied, ‘Never.'" In a letter sent to Grassley, which was obtained by Fox News, Ford’s longtime boyfriend said that she never discussed any sexual assault experiences, coached a friend on taking a polygraph test, and often flew without expressing any fear. "I witnessed Dr. Ford help McLean prepare for a potential polygraph exam. Dr. Ford explained in detail what to expect, how polygraphs worked and helped McLean become familiar and less nervous about the exam. Dr. Ford was able to help because of her background in psychology," Ford's former boyfriend wrote. Grassley concluded his letter by saying Ford's "testimony hinges on evidence to which Dr. Ford has repeatedly referred – some of which has already been provided to a nationally circulated newspaper – but which you have refused to provide to the Senate." UPDATE 3:27 p.m.: This post has been updated with McLean's denial that Ford ever helped her with a polygraph test. This entry was posted in Politics and tagged Brett Kavanaugh, Chuck Grassley, Supreme Court. Bookmark the permalink.